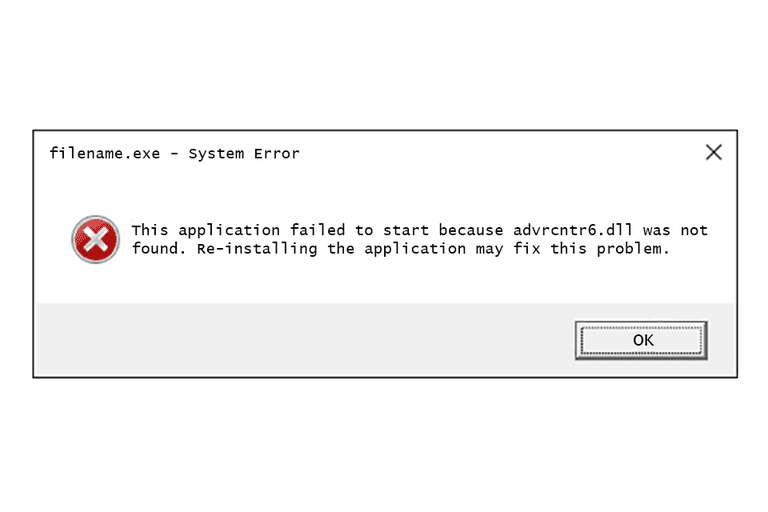 Advrcntr6.dll errors, most often the "This program requires the file advrcntr6.dll, which was not found on this system." error, are caused when, for whatever reason, the advrcntr6 DLL file is deleted or moved from its proper location. The advrcntr6.dll file might go "missing" because it was accidentally deleted from the folder because an antivirus or another security program mistakenly removed it thinking it was a security threat, or due to an issue when you last upgraded or reinstalled Nero. This program requires the file advrcntr6.dll, which was not found on this system. Most advrcntr6.dll "not found" errors are due to issues with the Nero CD and DVD burning software program. The advrcntr6.dll DLL file is a file that must exist in the correct folder for Nero to burn CDs or DVDs. The advrcntr6.dll error message might be seen during installation or when launching the Nero program, and could apply to nearly any version of Nero installed on any of Microsoft's operating systems that Nero is compatible with, like Windows 10, Windows 8, Windows 7, etc. Advrcntr6.dll errors may also appear on computers without Nero installed if the computer is infected with certain kinds of viruses or other malware. Do not, under any circumstances, download the advrcntr6.dll DLL file from any "DLL download site." There are several reasons that downloading DLLs from these sites are never a good idea. If you've already downloaded advrcntr6.dll from one of those DLL download sites, remove it from wherever you copied it to and continue with the following steps. Restart your computer. The advrcntr6.dll error might be a fluke, and since restarting fixes many common computer problems, a simple restart could clear this one up completely. If you see the advrcntr6.dll error during the installation of Nero, temporarily disable your antivirus software and try again. Sometimes, security software will interfere with an installation and prevent it from loading certain files, including this DLL file. If you follow through with this step, be sure to re-enable the security software after Nero installs normally. Record the serial number of your particular Nero installation. The easiest way to do this is by following the instructions provided by Nero on their Upgrade Center page. Once there, click Need to find the serial number? and follow one of the methods. Uninstall Nero from your computer. Be sure to uninstall using the Uninstall Nero link in the Nero program group (if available) in the Start menu, or use the Programs and Features or Add/Remove Programs applet in Control Panel. Another option is to use a free uninstaller tool like the popular IObit Uninstaller. Download the Nero General CleanTool utility: [Direct Download Link]. Extract and then run this free program from Nero. This utility will ensure that Nero is 100% removed from your computer. This file is in the ZIP format. Unzip it from within Windows or use a dedicated file unzipper like 7-Zip or PeaZip. Nero General CleanTool is only guaranteed to work with Nero 9/8/7 and Nero BackItUp4. Other versions of Nero should uninstall via the standard uninstall method in Step 3, but feel free to try CleanTool if you like. Restart your computer again, just to be safe. Reinstall Nero from your original installation disc or downloaded file. This step should restore the advrcntr6.dll file. Install the latest update to your Nero program if there is one available. There may have been certain issues in your original version of Nero that caused the advrcntr6.dll error you've been seeing. Run a virus/malware scan of your entire system if the Nero reinstallation steps don't resolve your issue. Some advrcntr6 DLL issues are actually related to hostile programs that masquerade as the advrcntr6.dll file. The advrcntr6.dll file should be located in the C:\Program Files\Common Files\Ahead\Lib folder. If you find the advrcntr6.dll file in the C:\Windows or C:\Windows\System32 folder, chances are it is not Nero's legitimate advrcntr6.dll file.